The North Korean ambassador to the UN Conference on Disarmament in Geneva said on Tuesday that sanctions against his country "will never work" and urged the international community to stop "dreaming". "The United States should know that sanctions and pressure will never pose a threat to the DPRK and will never work," said Han Tae Song at a meeting of the Democratic People's Republic of Korea. US President Donald Trump decided last week to impose new sanctions on North Korea, which he called "the heaviest ever imposed." Earlier, South Korean Foreign Minister Kang Kyung-Wha said in Geneva that "North Korea must realize that as long as it continues on the path of nuclear development, sanctions will continue." The minister "still dreams that international pressure can have an effect on my country," the North Korean ambassador said. "I will be very clear: this will never happen," he insisted. Han recalled that the DPRK "will not use the atomic weapon unless hostile forces attack our sovereignty and interests." 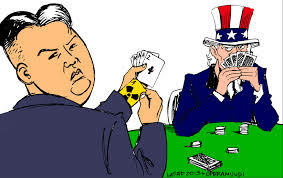 Using his right of reply, the US ambassador to the Conference on Disarmament, Robert Wood, assured that "the United States will never recognize North Korea as a nuclear state." He recalled that "any future discussion that the United States might have with representatives of Pyongyang should lead very clearly to the denuclearization of the Korean peninsula."